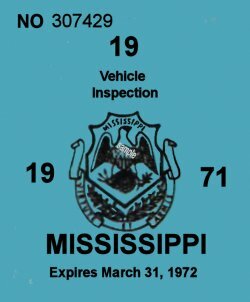 1971 Mississippi inspection Sticker - $20.00 : Bob Hoyts Classic Inspection Stickers, Add a Final Touch to your Restoration! This is 1971 Mississippi INSPECTION sticker is a perfectly restored reproduction of an original. Mississippi issued the sticker in 1971 and it expired in 1972 during the month listed at the bottom.